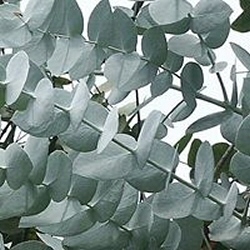 Distinctive because of its blue green, evergreen foliage and eucalypt fragrance when this foliage is crushed, Cider Gum (Eucalyptus Gunnii), is an unusual tree. Widely planted in the United Kingdom, it is very hardy. It is native to Tasmania and can grow approximately 2m (6ft 8in) per year. We think it makes an interesting ornamental tree but in addition it has major potential as an evergreen hedge. It is very easily trimmed and as a result this means that it will form a good evergreen hedging screen. Left untrimmed, this tree can reach a height of 30m (100ft)! Cider gum is supplied at a height of 1.25 metres in a 7 litre container, which means that the tree can be planted any time of the year and with better results than either bare-root or rootballed trees. Message included at no additional cost if required. Just add the information required at checkout.